Most people think that geothermal means heat pumps and residential heating and cooling- that’s not what we’re talking about, that’s called geo-exchange. The difference is temperature moderator (geo-exchange) vs. a positive thermal source (geothermal). 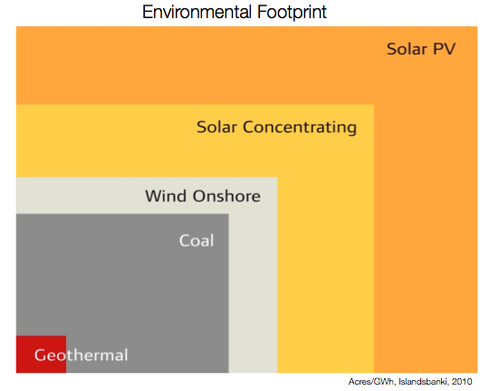 ​The illustration on the left is a geothermal power plant, whereas the illustration on the rights is a geo-exchange heat pump. ​In its simplest terms, geothermal means earth-heat. It is related to the thermal energy of Earth’s interior. On a large scale, the intensity of this thermal energy increases with depth, that is, the temperature of the Earth increases as we travel closer to its centre. 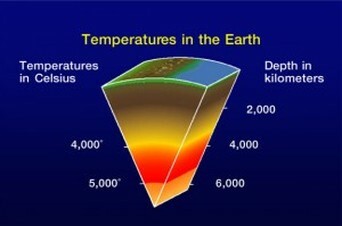 A global average for Earth’s geothermal gradient (temperature increase with depth) is approximately 30°C/km. For example, if we merely removed the outer 3 km of Earth’s outer surface, it would be a sphere 5,000°C at the core, and nearly hot enough to boil water on its surface. Earth contains an incredibly vast amount of thermal energy. This heat is used in a geothermal power plant to drive a steam turbine, which creates electricity. Any leftover heat can also be used in a variety of industrial heating applications. Geothermal energy has two primary sources: primordial heat, and radioactive decay. Primordial heat is what resulted from the creation of Earth 4.5 billion years ago, when the energy and mass from colliding cosmic matter made Earth a large, hot piece of space debris. As Earth’s outside cooled, it then acted as an insulator for the heat in the middle, which is why Earth is still cool and hospitable on the outside, and hot-rock and metal at its core. ​Some of the elements that were part of Earth’s original composition were radioactive. As those radioactive elements continue to decay below us (very slowly), they generate additional thermal energy and heat the Earth’s interior. ​Of course, some of the heat still seeps through the ‘insulation’, the evidence of this is volcanic features like those in Hawaii, New Zealand, Japan and Italy. A vast majority of the world’s power production involves the use of hot water. Sources like nuclear, coal and natural gas harness different processes (i.e. radioactive decay, combustion) to heat water into steam, which is run through a turbine to generate electricity. Geothermal energy uses the escaping heat from Earth’s core as a means to heat water and produce electricity. By drilling deep into the Earth’s interior, we find temperatures suitably high to produce electricity. Sometimes when we drill deep, there is hot water where the rock is porous (has space for fluids). In this case, we can extract the water from depth and through specialized equipment, use it to produce electricity (explained further on). If there is no water, but the rocks are very hot where we drill, it is possible to inject water to create an enhanced geothermal system (EGS) and hot water where it did not exist before. By using Earth’s thermal energy to heat water instead of processes with harmful by-products like coal and nuclear, geothermal energy can produce clean, reliable electricity as long as heat continues to seep from Earth’s interior (as it has for 4.5 billion years). Further, it is sustainable power because once we have extracted the thermal energy from the water or steam, it can be continuously re-injected deep underground to obtain more geothermal heat. 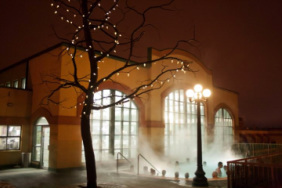 Aside from producing power, we also use hot, geothermal water for heating pools (i.e. hot springs), district heating, agriculture and laundries, to name a few. This is called direct-use geothermal because the heat is used directly from the water to serve a function. How Is Electricity Produced From Geothermal Heat? 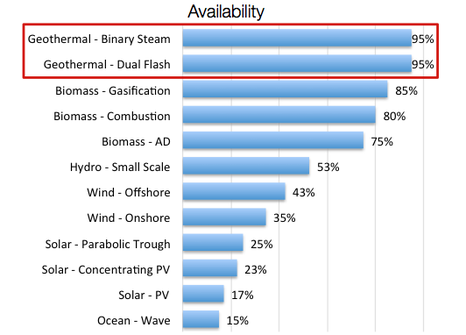 The first, flash geothermal, is generally associated with higher temperature geothermal sources ( >180°C). Because the pressure of the subsurface environment is much greater than at the Earth’s surface, water can exist as a liquid at very high temperatures. The high temperature, high pressure water is brought to surface, where it is enters a low pressure chamber and ‘flashes’ into steam. 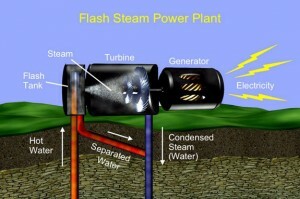 The pressure created by this steam is channeled through a turbine, which spins to generate electrical power. Once the steam has exited the turbine, it is either released into the atmosphere as water vapour, or it cools back into liquid water and is injected back underground. The second common method, binary geothermal, is common with lower temperature geothermal resources. It operates on the same principle that when a liquid is heated into a vapour, the resulting pressure can drive a turbine. However, because the temperatures are often too low to ‘flash’ water in a binary system, we must transfer the heat of water to a separate liquid with a lower boiling temperature. The separate liquid is called a ‘working fluid’. When the hot geothermal water is brought to surface from deep underground, it is run through a ‘heat exchanger’ which transfers the heat from the geothermal water to the liquid working fluid. Because the working fluid boils at a low temperature, it vaporizes readily with less geothermal heat, and this vaporization produces enough pressure to drive a turbine. 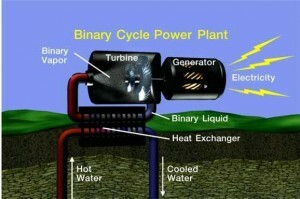 What makes a binary system unique is that it operates as a 2 closed-loops (hence, binary); neither the geothermal water nor the working fluid are exposed to the surface environment. All the water that is brought to surface is re-injected, and after vaporizing, the working fluid is cooled to its liquid state, so it may repeat the process. There are no-emissions in the binary geothermal cycle. 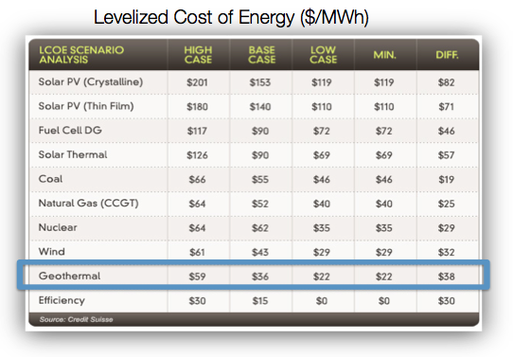 What is the direct utilization of geothermal heat? 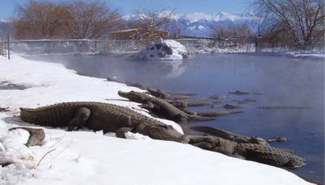 Geothermal heat allows alligators to thrive at the Colorado Gators Reptile Park for both site-seeing and to feed on tilapia carcasses from their fish farm. Temple Gardens Mineral Spa in Moosejaw, SK.